The story of the Renault Clio reflects the rise and changing shape of superminis over the past twenty years – from small, light, cheap and cheerful to overweight and all grown-up. However we’re happier than anyone to report that superminis are now getting lighter. In the case of the fourth-generation Clio the new model is around 100 kg lighter on average, although in the case of this model it’s around 30 kg lighter. This has been achieved despite it being bigger on the outside and on the inside with an extra 30mm in length contributing to a useful increase in boot space to 300 litres. The first thing you notice when approaching the Clio is the new styling which draws heavily from Renault’s show cars. It is a confident and edgy look which does a particularly good job at hiding the fact that the Clio is now only available as a 5-door. To be honest the sharp looks are so successful we’re not missing the option of a 3-door given the undoubted boost in practicality that the rear doors deliver. The interior is equally stylish although there is more than a passing resemblance to the Peugeot 208 which begs the question who copied who? At least there is clear water when it comes to performance. To its credit Renault has managed to get super low CO2 emissions without turning the wick down which makes the Clio one of the fastest low CO2 superminis. The latest Clio is lighter and more practical than its predecessor. It also has distinctive looks and good performance. 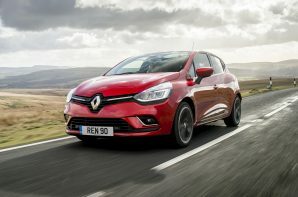 This is a very good start but when you add in the fact that it is also keenly priced we have to conclude that Renault has made a real effort with the Clio and deserves to move back up the sales charts.